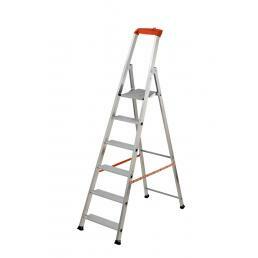 On Mister Worker™ you can find a wide range of stable and robust Gierre household ladders, designed to allow you to carry out household work in complete safety. Useful for cleaning or minor repairs, Gierre household ladders are among the most reliable on the market. They can be used both at home and in the office, and ensure exceptional stability during use. 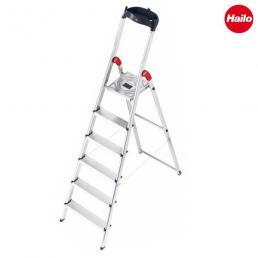 Among our customers' favorites there is the Hailo L60 home ladder with multi function tray. 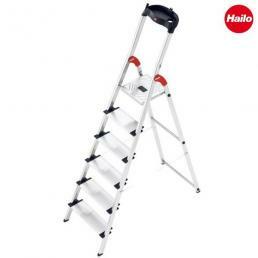 It is the perfect ladder to use at home: the platform and the large knurled steel reins guarantee maximum stability and safety, the feet are anti-slip and are fixed perfectly to the floor, and is equipped with an anti-lock system that makes it even more stable during use. There is also a variant with red parapet with bucket hook, ideal especially for cleaning tall furniture and windows. There are also other models of home scale: the Gierre Scalamia double aluminum ladder, lightweight but at the same time stable thanks to the anti-slip feet and anti-opening ropes; the Gierre PRO AL professional double ladder, equipped with a handrail to lean on when climbing and ideal especially for those who suffer from vertigo and who do not like using stairs; or the simple Gierre Stabila staircase, with a secure parapet and a small storage tray. Mister Worker™ offers a wide range of Gierre household ladders and Hailo domestic ladders, all certified EN 131 according to the legislative decree 81/08 on safety.